In 1524, Giovanni da Verrazzano sailed along the coast of present-day North Carolina and established a French claim to the area. Francis I was not impressed by reports of the discovery; he had hoped for either a passage to the East or gold and silver. 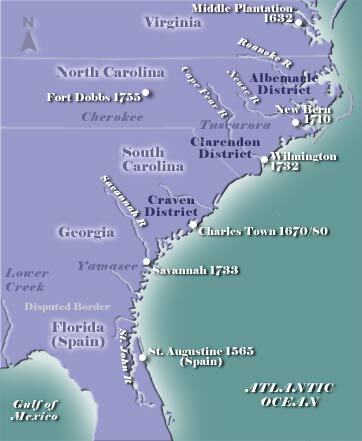 About 1526, Spain entered the scene when Lucas Vasquez de Ayllon established a small settlement at Cape Fear, but it failed because of disease and lack of food. Hernando de Soto, also representing Spain, marched his men northward in a search for gold and entered western North Carolina in 1540. No permanent settlements resulted from the French and Spanish efforts in this area. English efforts began in 1587 when an expedition formed by Sir Walter Raleigh was sent to establish the ill-fated settlement on Roanoke Island. In 1629, a grant of the southern portion of greater Virginia was issued to Sir Robert Heath, a prominent court figure under Charles I. Other than honor the king by naming the colony for him (Carolus being Latin for Charles), Heath did nothing to develop his holdings. the Craven district, which became present-day South Carolina. Sir William Berkeley of Virginia, one of the proprietors, was designated governor of Albemarle in 1664; this area would assume the name North Carolina in 1691 and become a separate colony in 1712. The settlers in northern Carolina were isolated from one another and other colonies. The coastal region was only slightly above sea level and choked with swamps and forests. Development centered around small farms engaged in the production of tobacco, corn and livestock; large plantations on the scale of those in South Carolina were rare. Many colonists insisted that they were ill-served by the proprietors, and this domestic unrest, coupled with an unresponsive royal government and some outside threats, led to a series of unsettling events in the late 17th and early 18th centuries. These included Culpeper's Rebellion, the Cary Rebellion, the Tuscarora War, the predations of Blackbeard the pirate and the Regulator Movement. North Carolina was designated a royal colony in 1729, a change that loosened the restraints on westward settlement. The settlers' increasing presence on the frontier led to further friction with the natives, particularly the Cherokee. The latter suffered a crippling defeat at Fort Dobbs, near present-day Statesville, in 1760. The following year, a treaty was signed in which the Cherokee surrendered their claim to enormous amounts of land.